A recent arrest wasn’t going to stop Conor McGregor from celebrating St. Patrick’s Day. 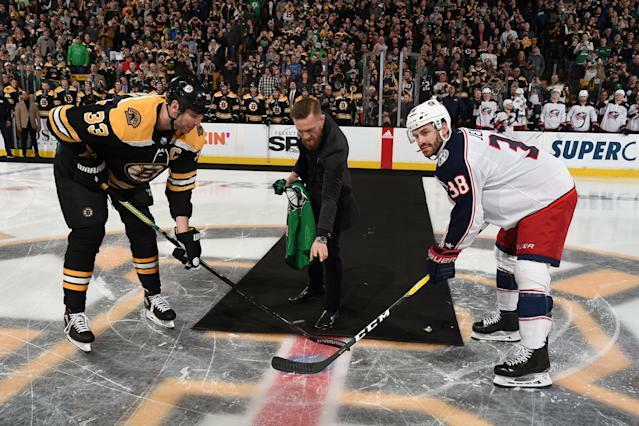 Just a few days after he was arrested after smashing a fan’s phone, McGregor appeared at a Boston Bruins game to drop the puck. Prior to the puck drop, a short video played introducing McGregor. He came out on the ice waving a green Bruins jersey. The Boston crowd erupted at the sight of McGregor. When it came time to drop the puck, McGregor may have gotten a little too excited. After dropping it, he turned to start pumping up the crowd again. McGregor nearly forgot to shake hands at center ice before realizing his mistake. The 30-year-old McGregor is facing a civil suit after the cellphone smashing incident. The man who filed the suit is reportedly seeking over $15,000 in damages. If McGregor’s appearance at the Bruins games is any indication, he’s not too worried about having to pay out that money.